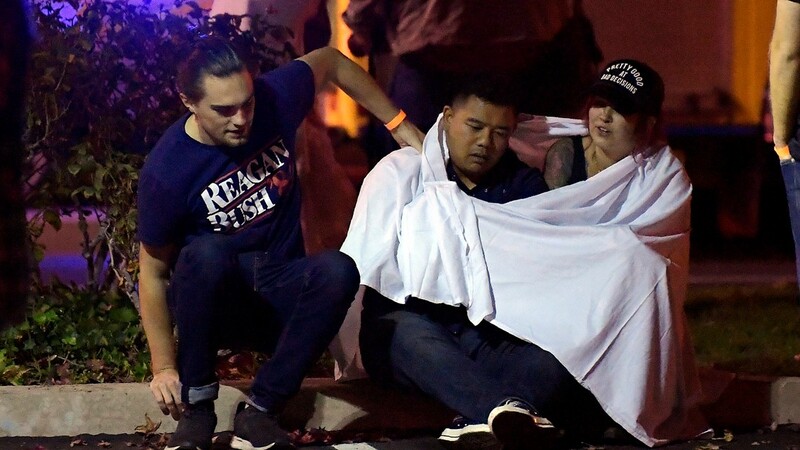 The shooting at a country music bar in Southern California is the deadliest mass shooting in the U.S. since 17 students and teachers were killed at Parkland High School. 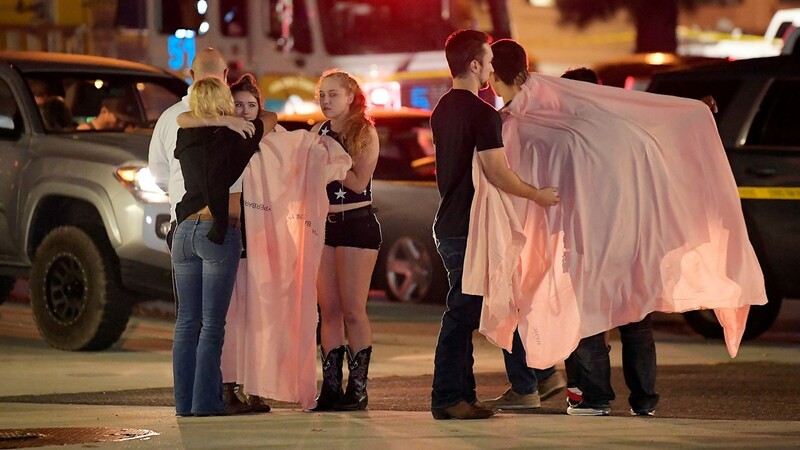 THOUSAND OAKS, Calif. — Using a smoke bomb and a handgun, a hooded former Marine dressed all in black opened fire during college night at a country music bar in Southern California, killing 12 people and sending hundreds fleeing in panic before apparently taking his own life, authorities said Thursday. Screaming in fear, patrons rushed for the exits, dived under tables, shouted "Get down!" 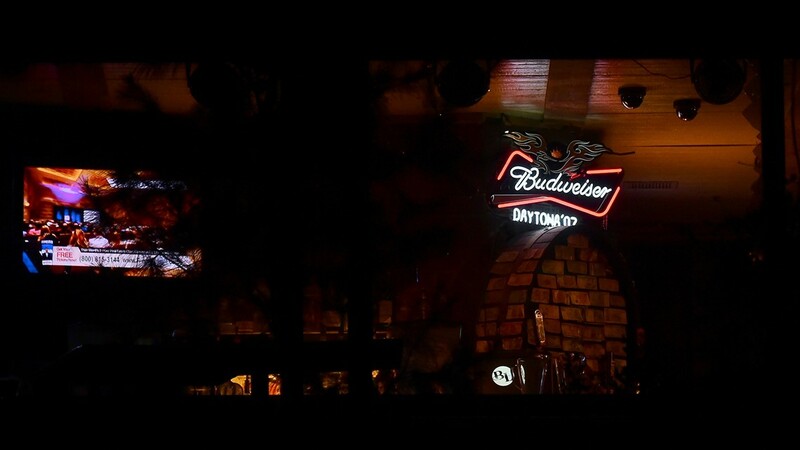 and used barstools to smash second-floor windows and jump to safety as gunfire erupted at the Borderline Bar & Grill, a hangout popular with students from nearby California Lutheran University. "I dropped to the floor," Sarah Rose DeSon told ABC's "Good Morning America." ''A friend yelled, 'Everybody down!' We were hiding behind tables trying to keep ourselves covered." 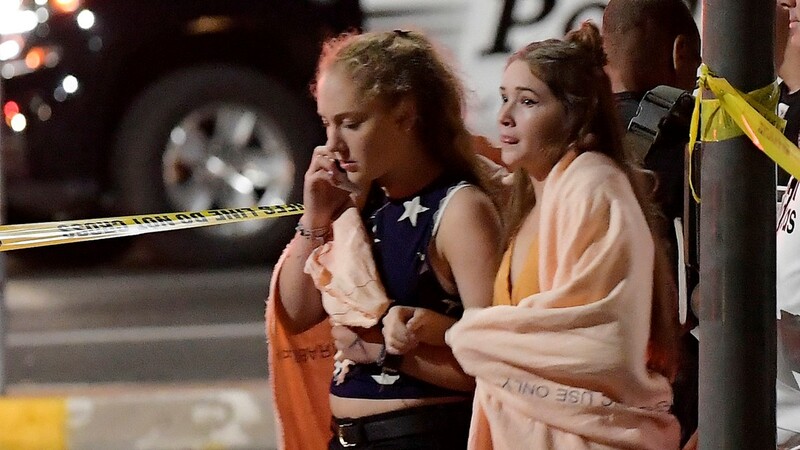 The bloodshed was the latest in what seems to be a never-ending string of deadly mass shootings that are happening with terrifying frequency across the United States. All morning, people looking for missing friends and relatives arrived at a community center where authorities and counselors were informing the next-of-kin of those who died. Many walked past TV cameras with blank stares or tears in their eyes. In the parking lot, people comforted each other with hugs or a pat on the back. "Oh, Cody, I love you, son," Coffman sobbed. "Sister Sister" actress Tamera Mowry-Housley and her husband said their 18-year-old niece Alaina Housely, a student at nearby Pepperdine University, was also among those killed . 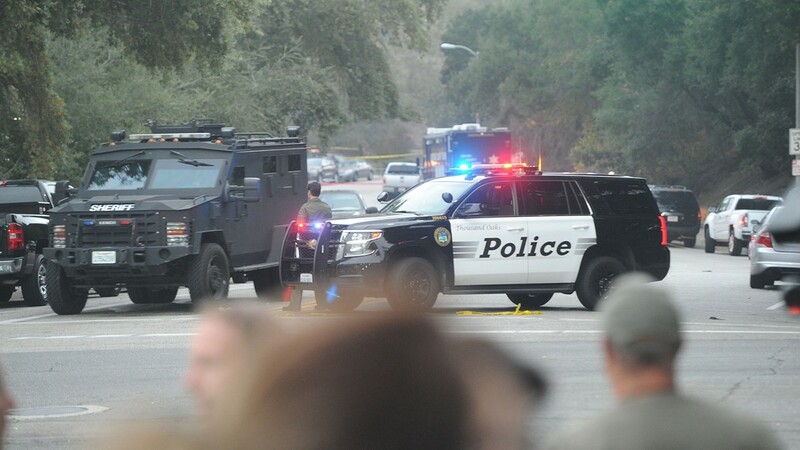 So was Justin Meek, a 23-year-old recent graduate of Cal Lutheran, according to the university. It was the nation's deadliest mass shooting since 17 students and teachers were killed at a Parkland, Florida, high school nine months ago. It also came less than two weeks after a gunman massacred 11 people at a synagogue in Pittsburgh. Democratic Gov.-elect Gavin Newsom, in his first public appearance since winning office on Tuesday, lamented the violence that has come again to California. 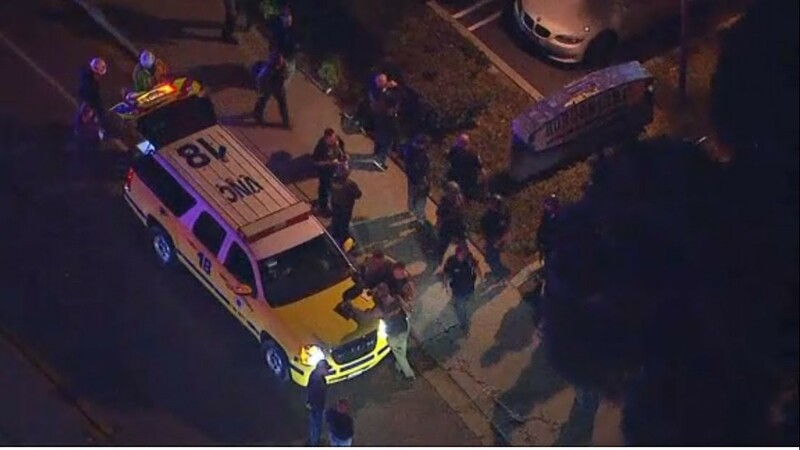 President Donald Trump praised police for their "great bravery" in the California attack and said, "God bless all of the victims and families of the victims." He ordered flags flown at half-staff in honor of the victims. 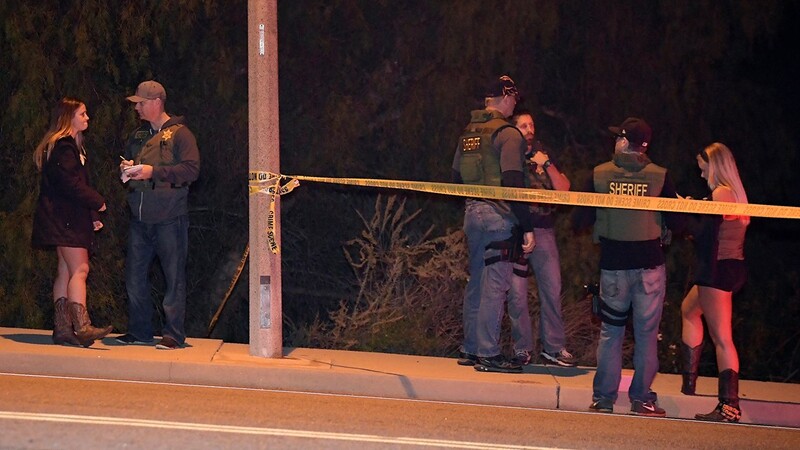 Authorities converged on Long's home in Newbury Park, about 5 miles from the Borderline bar, in a search for clues to what set him off. "There's no indication that he targeted the employees. We haven't found any correlation," the sheriff said. "Maybe there was a motive for this particular night, but we have no information leading to that at all." Long was in the Marines from 2008 to 2013, rose to the rank of corporal and served in Afghanistan in 2010-11 before he was honorably discharged, the military said. Court records show he married in 2009 and was divorced in 2013. Authorities said he had no criminal record, but Dean said officers were called to his home in April, when deputies found him angry and acting irrationally. The sheriff said officers were told he might have PTSD because of his military service. A mental health specialist met with him and didn't feel he needed hospitalization. Tom Hanson, 70, who lives next door to Long and his mother, said Wednesday that he called the police about six months ago when he heard "heavy-duty banging" and shouting coming from the Longs' home. "I was concerned because I knew he had been in the military," he said. Hanson said the sheriff's deputy who arrived took his information, but he never learned more about what happened and hadn't spoken to Long since then. He said he was "dumbfounded" by the bloodshed. Sheriff's Sgt. 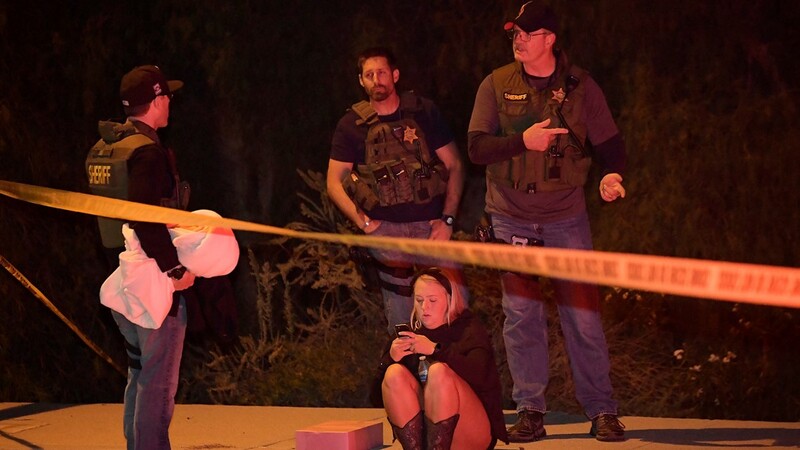 Ron Helus and a passing highway patrolman arrived at the Borderline around 11:20 p.m. in response to several 911 calls, heard gunfire and went inside, the sheriff said. Helus was immediately hit with multiple gunshots, Dean said. The highway patrolman pulled Helus out, then waited as a SWAT team and scores more officers arrived. Helus died early Thursday at a hospital. "There's no doubt that they saved lives by going in there and engaging with the suspect," said Dean, who was set to retire on Friday. He praised the slain officer — a close friend — as a hero: "He went in there to save people and paid the ultimate price." 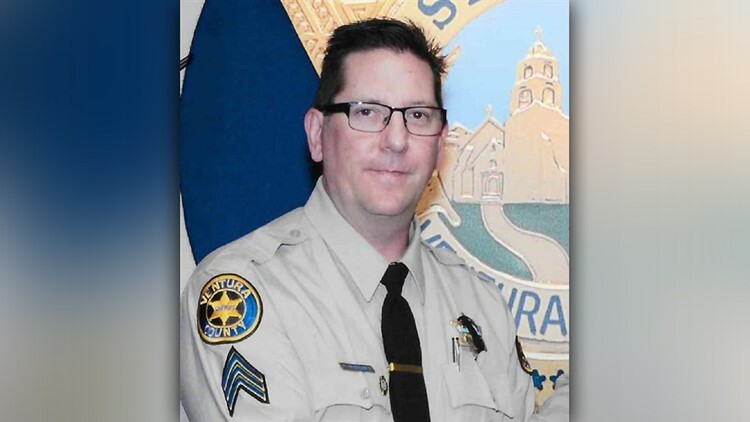 Ventura County Sheriff's Sergeant Ron Helus was killed when he confronted a gunman at a Southern California bar late Wednesday. "Unfortunately our young people, people at nightclubs, have learned that this may happen, and they think about that. Fortunately it helped save a lot of lives that they fled the scene so rapidly," he said. 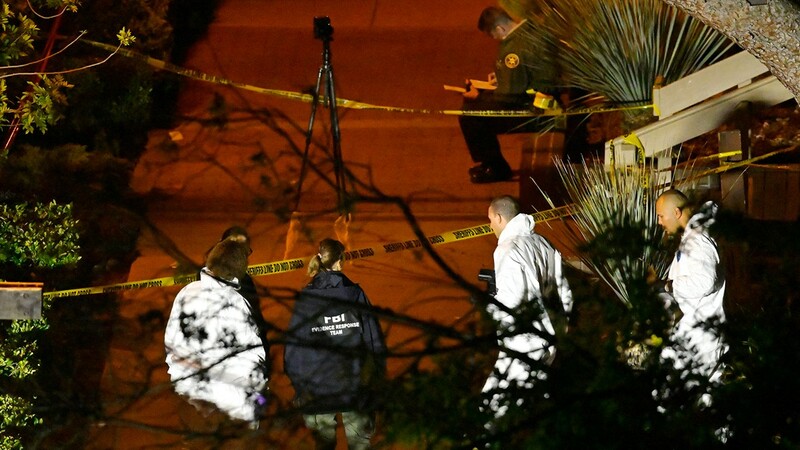 Shootings of any kind are extremely rare in Thousand Oaks, a city of about 130,000 people about 40 miles from Los Angeles, just across the county line. 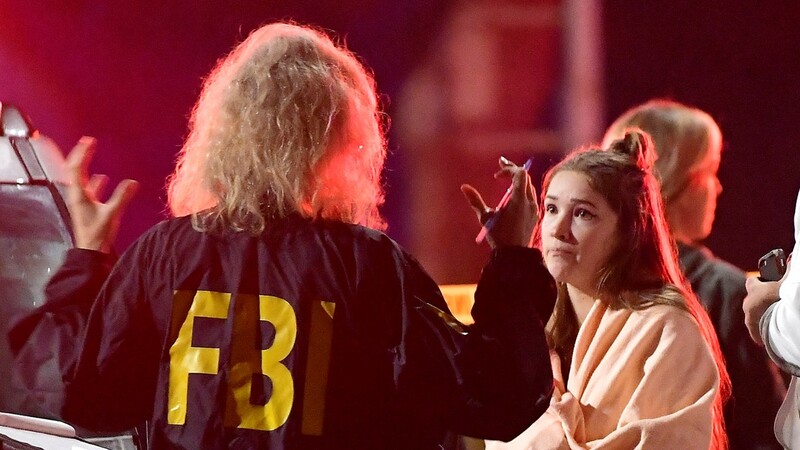 The Borderline, which includes a large dance hall along with several smaller areas for eating and drinking, was holding its regular "College Country Nights" when the attack took place. "It's going to be a very somber day," Steinwender said. "I know we don't have all the details in yet, but you know, it just feels like it's an attack on our community. You know, I think it's going to be something that we're going to have to come together and move past." 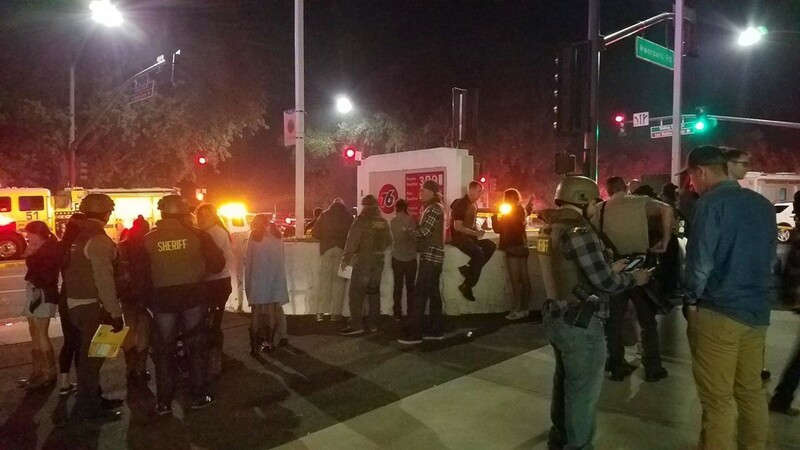 Cole Knapp, a freshman at Moorpark, said he was inside the bar when the shooting began, but he thought at first that it was "just someone with an M-80, just kind of playing a prank." Then he said he saw the gunman, wearing a small black head covering and black hoodie and holding a handgun. "I tried to get as many people to cover as I could," Knapp said. "There was an exit right next to me, so I went through that. That exit leads to a patio where people smoke. People out there didn't really know what was going on. There's a fence right there so I said, 'Everyone get over the fence as quickly as you can,' and I followed them over." 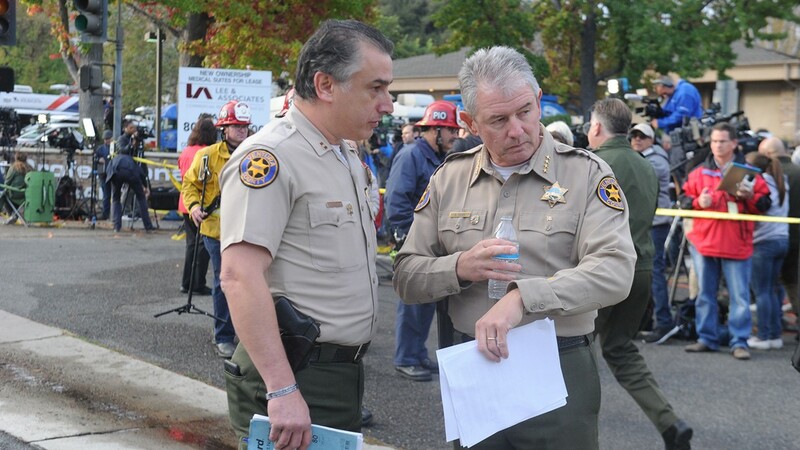 Ventura County Sheriff's Capt. 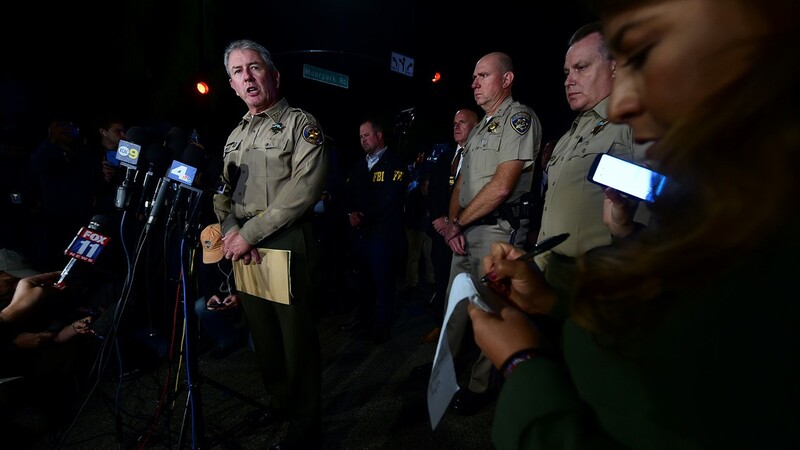 Garo Kuredjian stands with Sheriff Geoff Dean early Thursday morning before a press conference on the shooting at the Borderline Bar & Grill the night before. 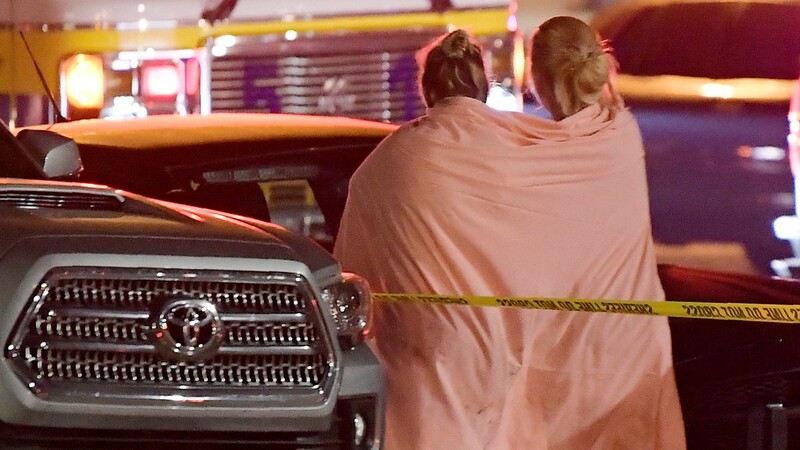 Sarah Silikula, 44, cries and is concerned about her daughter's friend after the shooting at the Borderline Bar & Grill, Calif.
A SWAT vehicle and dozens of police cars close off portions of the street near Borderline Bar & Grill in Thousand Oaks, Calif.
Media interviews people at the scene of a shooting at Borderline Bar & Grill Thursday morning in Thousand Oaks, Calif.
A forensics team works the scene Thursday, Nov. 8, 2018, in Thousand Oaks, Calif.
Light shines from inside The Borderline Bar and Grill, the scene of a mass shooting on November 8, 2018 in Thousand Oaks, California. People and officers gather near the intersection of Rolling Oaks Driver and South Moorpark Road Wednesday after a shooting at Borderline Bar & Grill in Thousand Oaks. 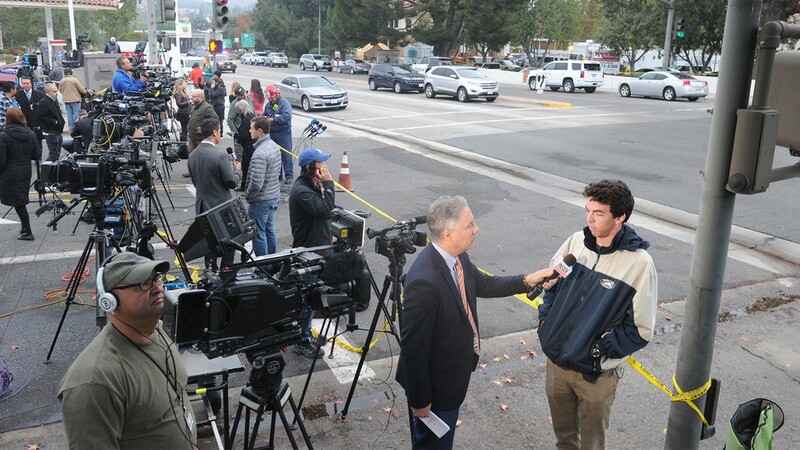 Ventura County Sheriff Geoff Dean briefs reporters at the intersection of US 101 freeway and the Moorpark Rad exit as police vehicles close off the area responding to a shooting at a bar in Thousand Oaks, California on November 8, 2018. 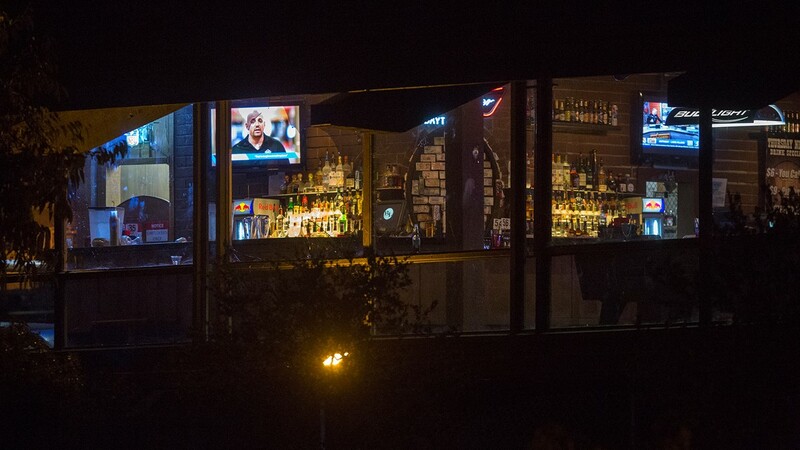 The inside of the Borderline Bar and Grill is seen after the shooting as police closed off the area in Thousand Oaks, California on November 8, 2018. "I screamed to him, 'There's a shooter in there!' He was kind of in disbelief, then saw that I was serious," Knapp said. He said he had friends who hadn't been accounted for. Tayler Whitler, 19, said she was on the dance floor with her friends nearby when she saw the gunman shooting and heard screams of "Get down!" "It was really, really, really shocking," Whitler told KABC-TV as she stood with her father in the parking lot. "It looked like he knew what he was doing." 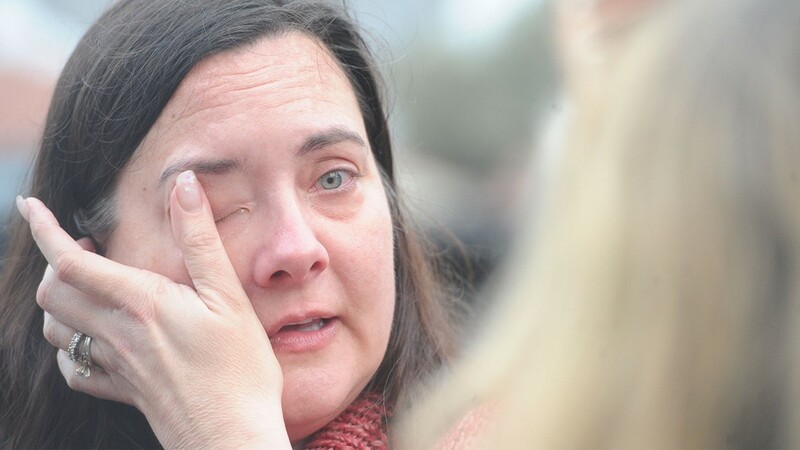 The slain sheriff's officer was a 29-year veteran of the force with a wife and son and planned to retire in the coming year, said the sheriff, choking back tears. "Ron was a hardworking, dedicated sheriff's sergeant who was totally committed," Dean said, "and tonight, as I told his wife, he died a hero because he went in to save lives."